The actions taken in 2008-09 by the G20 avoided an outright depression during the financial crisis, but questions remain over its ability to evolve from a short-term crisis response forum to effectively addressing more long-term challenges. This column argues that to ‘win the peace', G20 members as well as G20 Presidencies have to redesign international economic policy coordination, and ensure that the focus is kept on a limited number of deliverables to which all G20 members can agree. The G20 has emerged as the premier forum for international economic cooperation. The actions taken in 2008-09 by the G20 avoided an outright depression during the financial crisis. But while there was widespread agreement on what to do when the crisis broke out, this has not been the case since 2010, when the economic situation and outlook became increasingly divergent and governments started to have different readings of the challenges ahead and of the policy mix to adopt. Going forward, this raises the question of the G20’s ability to evolve from a short-term crisis response forum to effectively addressing more long-term challenges. In other words, the G20 should shift its focus from ‘winning the war’ – i.e. responding to the 2008 crisis to avoid the meltdown of the global financial system – to ‘winning the peace’, i.e. overcoming the legacy of the crisis and creating conditions for strong, sustainable, balanced, and, not least, more inclusive growth (Bertoldi et al. 2013, Buti 2016). Making the case for global cooperation is all the more critical in the context of growing populism and protectionism. This should also be seen in light of the recent US election and the incoming administration of President-elect Donald Trump being potentially less internationally engaged. G20 Leaders at the Brisbane Summit in 2014 set out the goal to increase G20 GDP by 2% in five years as a way of getting medium- and long-term growth back on track after the financial crisis. So far G20 members have made important progress but the goal might not be reached by the deadline of 2018. This is to be done by implementing reforms set forward in G20 members' individual growth strategies. Notwithstanding the efforts made, progress differs across sectors and countries, and the G20 is only about halfway there so far – with the impact of reforms set to collectively raise GDP by 1% by 2018. In addition, global growth has been repeatedly revised down. When we apply the 2% growth ambition to the current baseline (see Figure 1) we can see the importance of an integrated approach that combines short-term, medium-term, and long-term measures by using all policy tools – monetary, fiscal, and structural – to ensure the global recovery. At this stage, a complete implementation of all outstanding policy commitments, which is far from given, is estimated to have a collective GDP impact of 1.5% by 2018. It is clear that the lack of reform delivery comes at a cost – while in view of the repeated downward revisions of growth, we would need the opposite, i.e. stepping up the pace of reform. Note: At the Brisbane Summit, the potential impact of the G20 growth strategies was ambitious (the dashed blue line adding 2% of GDP by 2018). 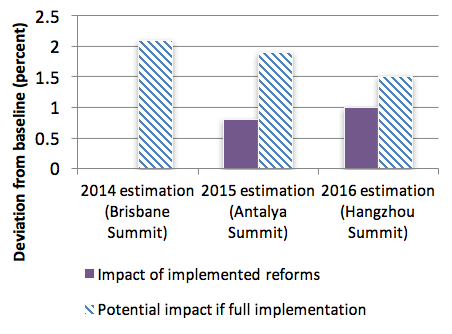 Today, due to a number of downward revisions to the baseline and slower than expected implementation of the agreed structural reforms, the full implementation scenario results in a lower impact (the purple lines) implying a significantly lower level of GDP by 2018 taken together. Source: Calculations by the European Commission based on OECD and IMF assessments. Note: The potential impact of full implementation of the G20 growth strategies by 2018 has diminished over time (from 2.1 to 1.5%) as the pace of implementation has been slower than expected. 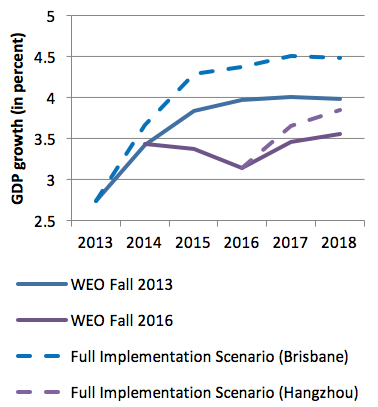 To deliver the full GDP impact by 2018 as proposed in Brisbane, the G20 growth strategies would have to be fully implemented by end 2016 and additional measures would have to be taken. Currently, implementation is half way and if all outstanding measures are put in place by the end of 2017, GDP could be 0.5% additionally higher. What do we need for a better outcome when discussing the economic policy mix in the G20? When looking at when international policy coordination has been successful in the G20, several shared factors seem to be present. Can we draw some lessons from successful policy coordination, e.g. on ensuring sufficient resources for the IMF, international tax issues, financial regulatory reform, and anti-money laundering? We see four conditions on why the G20 has been able to continue to deliver on tax and financial regulation, but less so on macroeconomic policy. A first precondition is having an aligned diagnosis of a problem. The IMF in their latest World Economic Outlook projected global GDP growth at 3.1% in 2016 and 3.4% for 2017, which is well below the pre-crisis average of 3.8% per year. At the same time, the OECD has pointed out that the global economy remains in a "low growth trap" with weak global demand, trade, investment, and productivity. This diagnosis of a subpar global recovery, and the reasons behind it, are shared among many G20 members. However, other G20 members view global economic growth in line with the long-term trend, while also taking into account the developments of ageing populations. These diverting views may also reflect that some countries are operating close to potential, while others show slack. In the Eurozone, for example, the economic slack is still significant at the end of this year with weak domestic demand, primarily held back by investment (European Commission 2016). This leads to different interpretations of the policy actions needed – depending also on whether it relates to an advanced economy, emerging market, commodity exporter, and so on. The diagnosis in other policy areas is more broadly shared, which has led to a greater reform momentum in the areas of international tax transparency or financial sector regulation. Second, there is a need to be able to show success in implementing commitments. G20 commitments should be sufficiently tractable, controllable, and measurable, allowing members to directly link their commitments to the deliverables/outcomes. In areas such as financial regulation or tax transparency, it is easier to monitor implementation as members are expected to implement the same or similar types of measures – such as specific technical frameworks for enforcement or oversight. This is not as straightforward as when ‘one-size-fits all’ measures are not an appropriate approach. Economic policies are by default country-specific and, as such, conditional on the income level, cyclical position, fiscal space, and societal preferences of the country in question (IMF 2016). That being said, it is welcome that in 2016 the G20 agreed on an indicator system that helps to assess and monitor the progress of structural reforms, as well as their adequacy in addressing structural challenges, e.g. public investment as a share of GDP, trading across borders, etc. (G20 FWG 2016). Third, policy coordination needs to be inclusive and relevant for citizens. An example of this kind of coordination by the G20 can be seen on the tax agenda where citizens clearly support fair tax policies, as the profits are used to improve inclusiveness as well as providing much-needed public goods and services. In policy areas such as financial regulation and taxation, the actions taken by the G20 respond to visible economic and political challenges, for example the problems exposed by the Panama leak and the financial crisis. Tackling shared problems brings increased ownership across society. Finally, the benefits of international coordination need to be visible. Positive spillovers from coordination are a major reason for the existence of the G20 in the first place. In a recent paper, the IMF has underlined again that coordinated policies across major economies amplify the helpful effects of individual policy actions, through positive cross-border spillovers (Gaspar et al. 2016). At the same time, minimising negative spillovers is also a very important objective. In fact, building a climate of trust in regular meetings is already a first step in reaping the benefits of positive spillovers, and could be seen as a welcome insurance policy in addressing sudden global disruptions. A very obvious example of visible positive benefits from coordination is the G20 Leaders’ agreement in Brisbane on the new global Common Reporting Standard for Automatic Exchange of Information (AEoI), to be implemented by 2018. Even before its actual implementation, the impacts of AEoI are already being realised. A total of €48 billion in additional revenues were collected by governments through voluntary disclosure in 2014. More will come by progressing with implementation (Gurría 2015). Therefore, benefits of international cooperation and coordination should be clearly communicated to the public, so as to be easily understood and accounted for. This in turn would raise the credibility of the G20, for example by recognising how the G20 managed to avoid a global depression similar to that of the 1930s by agreeing on a coordinated macroeconomic stimulus response. At the same time, it is easier to identify clear economic and financial spillovers than the more indirect ones stemming from the political economy of working together. There, the perceived benefits appear less pronounced more recently. The question is now how to get better traction for the G20 Growth Strategies, which is the main instrument of economic policy coordination. How can the G20 operationalise the four conditions set forward above to ensure more successful economic policy coordination? We outline four suggestions. First, the diagnosis of the problems facing the global economy should be strengthened at the political level (Bertoldi et al. 2016). G20 Leaders committed to using all policy tools – monetary, structural, and fiscal – to ensure the global recovery. Building on the increased common understanding that monetary policy is overstretched, there is a need to activate structural and fiscal policies. Structural reforms must be pursued more forcefully to, at least, close the gap on outstanding commitments. G20 members have already committed to structural reforms in their growth strategies – now it is an issue of implementation. Fiscal strategies are equally important to support the common G20 growth objective and address inclusiveness. In this respect, an area for progress could be to integrate concrete steps on fostering the quality and composition of public finances into the growth strategies – as this is as important to consider as the fiscal stance, especially for countries with fiscal constraints. Overall, stepping-up the quality of public finances fits well within the conditions set forward above for G20 reform delivery, and could be a constructive way forward to improve the global economic policy mix. This could complement the upcoming German G20 Presidency's focus on fiscal resilience by fostering growth and inclusiveness. Second, tractability could be improved by a better identification of measures and deadlines for delivering on economic policy commitments agreed by G20 members. This could be done by streamlining and focusing the Growth Strategies while strengthening peer review. Instead of having broad key commitments, each G20 member's growth strategy could be focused on a few measurable, specific and high impact headline policy measures. Tractability could be further underpinned by a different type of peer review, e.g. focusing on policy themes by sharing best practices on key policy actions and the conditions for their effective implementation. Furthermore, a greater transparency about the economic impact of different measures could foster a better understanding of what type of reforms worked, where, and why. Third, to increase ownership and ensure that the reforms and policies brought forward respond to a real need by citizens, each G20 member should themselves identify a limited number of reforms (as opposed to the broad number of reform commitments that are contained in the G20 growth strategies at the moment) that have the most substantial growth and/or equity impact. Further, there is room for improving communication to the public regarding the concrete outcomes and benefits of the policy action taken by the G20. Lastly, we need to show the positive spillovers from international coordination. Areas with clear benefits from international cooperation are, for example, infrastructure investment, investment into the digital economy, or lower or less distortive taxation. Increased cooperation on these issues would have a positive effect on inclusiveness both directly and indirectly as such reforms can target growth, productivity, and equity. Simulation results from international policy coordination always depend on the selected model framework and assumptions. That being said, the IMF has also weighed in on the benefits of policy coordination and cooperation to improve outcomes. The IMF found that: "Complementary and mutually reinforcing action in all members would help secure stronger and healthier global growth. The upside scenario shows that tangible benefits for the entire membership in terms of jobs and growth are within reach—global output would be higher by about 2½% in five years and global imbalances would be lowered further by ¾% of GDP. Cumulative gains would be larger. Collective and comprehensive policy action also helps insure against possible welfare losses associated with downside risks" (IMF 2012). Analyses by the European Commission staff and other institutions show that there can be positive spillover effects from simultaneous reform implementation and from higher public investment in countries with low debt and deficit levels under the current monetary policy constraints (Varga and Int'Veld 2014, In't Veld 2016, Blanchard et al. 2016). In conclusion, to win the peace, G20 members as well as G20 Presidencies have to recognise the need for integrating prior policy commitments with new priorities, and ensure that the focus is kept on a limited number of deliverables to which all G20 members can agree. For the upcoming German G20 Presidency, this means linking the Hangzhou commitments to their overarching priority of resilience. Broadening the discussion to also include elements on the composition and quality of public finances would help build greater support for debt sustainability, as well as address growth and equity challenges. The G20 needs to walk the talk with regards to the three-pronged approach to shift the burden away from monetary policy and really use all policy tools to ensure a strong, more sustainable, and better balanced recovery, in a way that fosters inclusiveness to a much greater extent. Only by addressing protectionism and populism head-on, can the G20 win the peace. That requires that all members remain fully engaged. Bertoldi, M, H Scherrer, and G Stanoeva (2016), "The G20 and the EU: A Win-Win Game", European Economy, Economic Brief 009, April. Bertoldi, M, H Scherrer, and G Stanoeva (2013), "The [email protected]: Is It Still Delivering? ", ECFIN Economic Brief, Issue 27, November. Blanchard, O, C Erceg, and J Linde (2016), "Jump starting the euro area recovery: would a rise in core fiscal spending help the periphery? ", NBER Macroeconomics Annual 2016, Volume 31. Buti, M (2016), "Europe in the new global economic governance: can we still make a difference? ", Economica Politica 33(2): 119-127. European Commission (2016), European Economic Forecast, Autumn 2016, Box 1.4 "How is the recovery proceeding in the euro area?”, November. Gaspar, V, M Obstfeld, and R Sahay (2016), "Macroeconomic Management When Policy Space Is Constrained: A Comprehensive, Consistent, and Coordinated Approach to Economic Policy", IMF Staff Discussion Note SDN/16/09. Gurría, A (2015), "Fair play - the rule of the game in international taxation", remarks at the Antalya G20 Summit session on enhancing resilience, November. G20 FWG (2016), "G20 Enhanced Structural Reform Agenda", Prepared by the G20 Framework Working Group, September. IMF (2016), "A Guiding Framework for Structural Reforms", IMF Staff Note, April. IMF (2012), "Toward Lasting Stability and Growth", Umbrella Report for G-20 Mutual Assessment Process, June.